Robert Maxwell Deans (born 4 September 1959) is a New Zealand rugby union coach and former player, currently the head coach of Japanese club Panasonic Wild Knights. He was head coach of the Australian national team between 2008 and 2013. Deans had previously coached the Crusaders for eight seasons and was an assistant coach of New Zealand between late 2001 and 2003. As the coach of the Crusaders, Deans has won more Super rugby titles than any other (three Super 12 titles and two Super 14). He has also coached Canterbury in the National Provincial Championship, winning the title in 1997. As a player, Deans represented Canterbury, first playing at fly half, and later fullback. He also played nineteen matches for the All Blacks, including five tests. Deans attended Christ's College, Christchurch as a boarder where he played rugby mainly at first five-eighth. He made his provincial debut for Canterbury in 1979 and played mainly at fullback, as the team already had future All Black coach Wayne Smith playing at first-five. Deans was the first-choice goal-kicker for the team and scored 1,641 points for the union. He was a member of the Canterbury team during the Ranfurly Shield era of the early 1980s. This included kicking eight of Canterbury's 16 points in its 16–12 challenge win over Wellington in 1982. The shield reign ended in 1985 against Auckland in "the match of the century" where Deans also played. This reign is the longest in Canterbury rugby union history. He went on to represent Canterbury 146 times, with his career ending in 1990. Deans also played for New Zealand's national rugby team, the All Blacks. His first game for the All Blacks was against Edinburgh on 26 October 1983. Deans played five tests for the All Blacks, scoring 50 points. He played an additional 14 games for the All Blacks scoring 202 points. His All Black career lasted less than two years, playing his last game against a Mar del Plata selection on 29 October 1985. He did however participate in the controversial Cavaliers tour of South Africa in 1986. Deans also played cricket for Canterbury Country in the Hawke Cup. Deans was appointed as coach of the Canterbury team for the 1997 National Provincial Championship (NPC) season. He was assisted by Steve Hansen (current All Black coach). Deans' first season was a success, with Canterbury beating Auckland for the first time in 14 years, then going on to win the title. The following year he managed the Canterbury Crusaders (since renamed Crusaders) Super Rugby franchise who were coached by Wayne Smith. The Crusaders won the title, beating the Auckland Blues (since renamed the Blues) in the final at Eden Park. The Crusaders repeated this feat the following year, with Deans again manager. In 2000 Deans took over as Crusaders coach after Wayne Smith became All Blacks coach. He coached the Crusaders to their third successive Super 12 title that year, beating the Brumbies in Canberra. He continued to coach the Canterbury team in the NPC in 2000 which lead to a Ranfurly Shield win over Waikato; the shield was held until 2003 (totalling 23 challenges). Canterbury's success in the 2000 season saw them host the NPC final at Jade Stadium against Wellington. A victory would have seen Deans coach teams to Super 12, Ranfurly Shield and NPC titles in the same year; however eventually Wellington won 34–29. From 2001 Deans concentrated solely on the Crusaders. The 2001 Super 12 season was his least successful in charge – the Crusaders finish tenth. But the following season, the Crusaders went through the entire season undefeated and won their fourth title overall, and their second with Deans as coach. In the following two seasons the Crusaders finished runners-up to the Blues in 2003, and then the Brumbies in 2004. The Crusaders won their third title under Deans in 2005. The Crusaders won their sixth title (the first of the expanded Super 14) in 2006, and their fourth win with Deans in charge, making him the most successful coach in Super Rugby history so far. In 2008, Deans' last season in charge of the Crusaders, he coached them to a seventh super rugby title after they beat the NSW Waratahs at Jade Stadium. In honour of the Deans family, Jade Stadium (now AMI Stadium) erected a new stand called the "Deans Stand". Following the 22 February earthquake, there remains doubt as to whether AMI Stadium will ever be used again, after some of the ground, including parts of the Deans stand, suffered structural damage. As a result, the new stand was not showcased during the 2011 Rugby World Cup. John Mitchell appointed Deans as his assistant when he became All Blacks coach in late 2001. Deans held the position until Mitchell was replaced after the 2003 Rugby World Cup. Under Mitchell and Deans, the All Blacks won the 2002 and 2003 Tri-Nations titles, as well as the Bledisloe Cup in 2003. 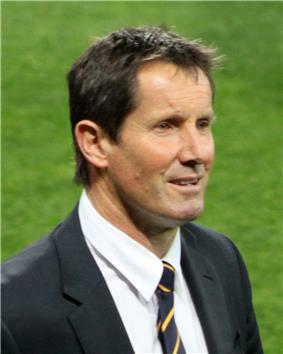 On 14 December 2007, it was announced that Deans had been appointed the new Australia coach. The contract was for four years – leading into the 2011 Rugby World Cup – as Deans became the first ever foreigner to coach Australia. His contract with the Crusaders finished after the 2008 season and the New Zealand Rugby Union agreed to allow Deans to continue as Crusaders coach through the 2008 Super 14 season. Deans started well as coach of Australia by winning his first five tests, including the largest win over the All Blacks by the Wallabies in nine years. He ended his debut year of 2008 with mixed resuts. Australia under Deans lost the following three tests against the All Blacks, coached by arch-rival Graham Henry, but secured home and away wins over reigning the Rugby World Cup champion Springboks – Australia's win in South Africa was its first there in eight years. The Wallabies lost the third match to the Springboks by a record 53–8 score. There were also narrow wins over limited opposition in Italy and against a weakened Irish team. In 2010 Deans also became the first Wallabies coach to win on the South African highveldt in 47 years after the team won 41–39 in Bloemfontein, thanks to a penalty goal from Kurtley Beale with no time left. While coaching the Wallabies in 2011 they had a mixed year - losing to Samoa before another loss to the All Blacks in Auckland, and defeating South Africa both home and away. In the 2011 Rugby World Cup, Australia suffered a surprise loss to Ireland in pool play, finishing second in their pool and going on to defeat South Africa 11-9 before another loss to the All Blacks (20-6) in the semi final. Dissatisfaction amongst players and supporters with the conservative game plan employed by the Wallabies during and after the world cup, a win rate hovering around 60%, and a poor 3-15 record against the All Blacks led to Deans came under increasing pressure to keep his coaching position. According to rugby writer Gregor Paul, there was also "widespread frustration at Deans' refusal to make peace with Quade Cooper and welcome him back into the set-up after proving himself the best first-five in Australia during Super Rugby" in 2013. Following the Wallabies 2-1 series defeat to the British and Irish Lions on their 2013 tour and a record 16-41 defeat in the decider, Deans handed his resignation into the ARU thus ending his role as head coach of the Wallabies. During his six-year tenure, Deans coached the Wallabies on 74 occasions winning only 43 times, losing 29 and drawing twice. He won just 3 times against their main rivals, the All Blacks, and drew once in 2012. He holds a good record against the Springboks, 9 wins from 14, and led the Wallabies to a Tri Nations championship in 2011 and to 3rd place in the 2011 Rugby World Cup. On 21 April 2014, Deans was announced as the Panasonic Wild Knights new Head Coach, succeeding Norifumi Nakajima. His brother, Bruce, was an All Black and member of the Canterbury team. His great-uncle, Bob Deans, was an All Black and also captained Canterbury. ^ Deans was referred to as Robbie 'Dingo' Deans within New Zealand media in 2008, at a time when he still had a perfect winning record for the Wallabies, including a record 34–19 victory over the All Blacks in 2008 with Australia's highest number of points scored in a win against New Zealand. ^ a b "Sportsfreaks Top 10 Shield moments". sportsfreak.co.nz. 17 July 2006. Retrieved 28 October 2006. ^ "Thanks for the Memories". crfu.co.nz. 25 September 2006. Archived from the original on 7 October 2006. Retrieved 28 October 2006. ^ Howitt (2005), pg 51. ^ Howitt (2005), pg 65. ^ "Robbie Deans appointed as Wallabies coach". PM. ABC. 14 December 2007. Retrieved 20 June 2013. ^ "A personal message from Crusaders coach Robbie Deans". Canterbury Rugby Union. 17 December 2007. Archived from the original on 5 June 2008. Retrieved 12 February 2008. ^ a b Wildman, Rob (27 July 2008). "Sean Fitzpatrick warns that New Zealand are close to crisis". The Telgraph. London. Archived from the original on 5 August 2008. ^ a b Paul, Gregor (7 July 2013). "Secret talks to replace Deans after Wallabies collapse". Sunshine Coast Daily. ^ "Lions roar past Wallabies to break tour drought with third Test rout of Wallabies". Australian Broadcasting Corporation. 7 July 2013. ^ "It's all over now for Robbie Deans as Lions thump Wallabies to clinch series". Herald Sun. 7 July 2013. ^ "Australia coach Robbie Deans resigns following Lions defeat". BBC. 9 July 2013. ^ "Robbie Deans steps down as Wallabies coach". Australian Rugby. 9 July 2013. ^ "Robbie Deans Statistics". Lassen. ^ Robbie Deans nouveau manager de Panasonic Wild Knights! ^ "Australia destroy hapless All Blacks". Stuff.co.nz. 26 July 2008. Archived from the original on 17 January 2015. Retrieved 17 January 2015. ^ "Test matches/Team records". ESPN scrum. "Robbie Deans". TheRoar. Retrieved 11 December 2007. Gifford, Phil (2004). The Passion – The Stories Behind 125 years of Canterbury Rugby. Wilson Scott Publishing. Howitt, Bob (2005). SANZAR Saga – Ten Years of Super 12 and Tri-Nations Rugby. Harper Collins Publishers. McIlraith, Matt (2005). Ten Years of Super 12. Hodder Moa.